Our plan from here was to hire two sea kayaks in Moab and paddle down the Colorado River from just outside the town where we walked past yesterday. 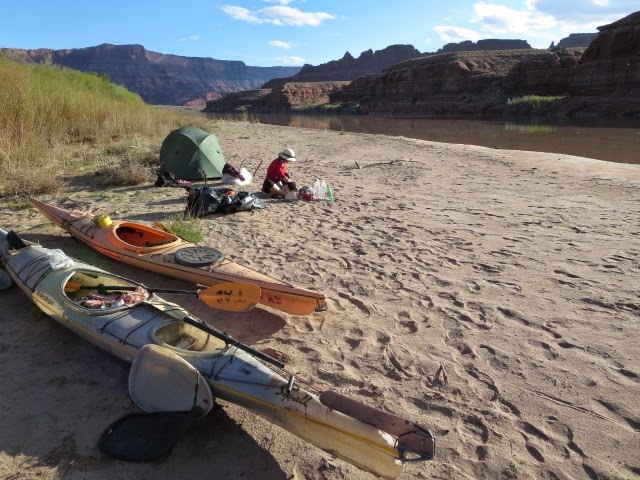 Loaded with 9 days of food we intended to paddle for 70 miles or so, have the kayaks picked up for us and returned to Moab whilst we shoulder our backpacks and hike on for another 65 miles through Canyonlands National Park before reaching a road. The boats were a tad silty looking (for reasons which were to become obvious to us in due course). We had never paddled a river before and were pleasantly surprised when we put in that even without paddling we were moving at walking speed. Keeping up a relaxed paddling pace we made 5 miles per hour! The water was a thick cappuccino, silty brown color and the paddles disappeared from sight once submerged under the water. Although on our first day a minor road followed the river it was still a pleasure staring up at the big red, black walls above the thick green vegetation lining the river. Our schedule gave us plenty of time so we stopped at midday to hike up to Corona Arch. The shore was made up of deep silty mud and we already become caked in it! We passed a canoeist on this first day and a motorized tour boat came up river but that was all the river traffic we saw. Later on we saw Potash Mine but soon floatedby in our own world. We found ourselves an idyllic sand flat to hitch up the kayaks and set up camp for the evening. What a great day! 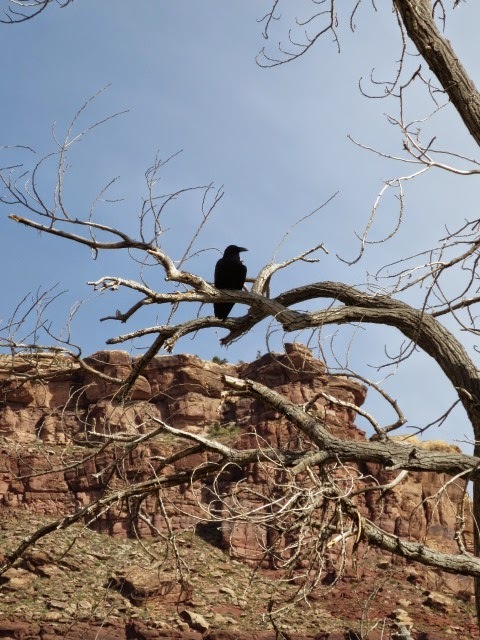 And so we followed the meandering river for another day underneath red and pink and orange and maroon walls and towers, camping on sandbars and ledges. The unexpected things were 1) the deep incredibly sticky mud and 2) the number of beavers and Canada geese we encountered! Today we crossed into Canyonlands National Park and the water levels dropped along with the water flow rate- probably settling after the rain a few days ago. We stopped at Lockhart Canyon paddling through the rushes up a small inlet before getting out and hiking up canyon for a while. It was super hot though, the air was definitely cooler kayaking on the river. Back at the kayaks we set up camp on a little sand bank island in the river. The river flowed silently by on both sides and it was another great spot. Luxury meal of tortilla, beans, salsa mashed potato and Chardonnay wine. Bats, ravens and Canadian geese around the campsite- we could get used to kayaking on the river! A slow start today as we had plenty of time. 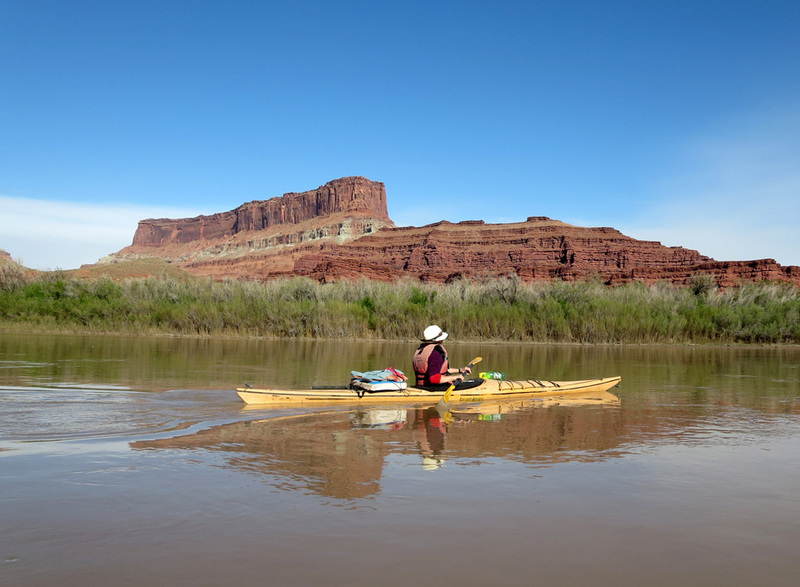 Martina paddled into the inlet again to collect some fresh drinking water to save us cleaning the silty Colorado River water. It was cool first thing but the cloud overhead soon dispersed to give hot conditions again. The dreamlike meandering down the river continued until we stop at midday at Rustler Canyon on a steep mudslope. Behind the thick tamarisk though there was a cleared area for camping and we met a family there paddling with their children- what an adventure! 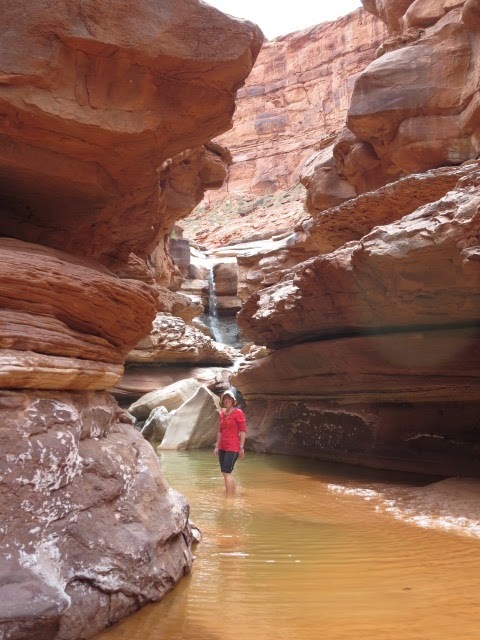 We hike up Rustler Canyon to a scenic waterfall and pools and manage a dip in lovely cold water. Further upstream the Hayduke trail crosses Rustler Canyon. Back in the kayaks a wind got up and it clouded over, but still remained hot. The wind made it harder work for us- funneling upstream against us. Further on the character of the canyon changed as the rock walls closed in on us and the river took some dramatic ‘gooseneck’ meanders. The options for beaching the kayaks disappeared so we kept paddling until we saw a high muddy ledge and go for that. It turned out to be an excellent pre-used site with a fantastic perch for the tent 100 feet above the river. 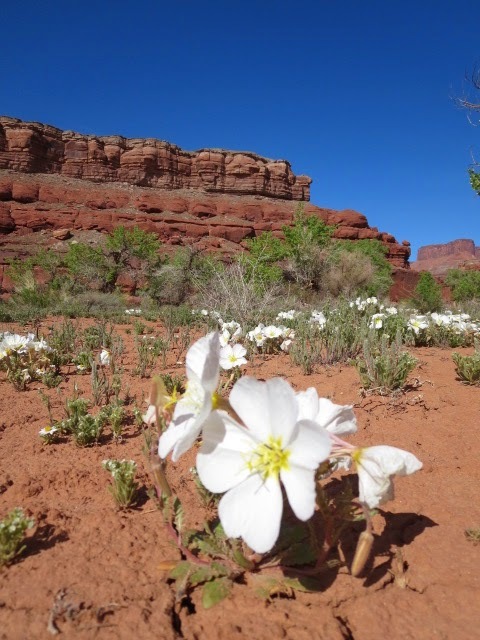 Lots of desert flowers around and a boulder with a petroglyph panel. There was rain overnight but otherwise we had a very comfortable camp in a dramatic spot with no-one else around. In the morning we hiked up to the narrow neck between the loop of the Colorado river in a unique spot. After a bit of ferrying the gear down to the mud take off point, we floated off again in a very still, gently flowing river. Brian spotted a beaver at close quarters swimming near a sandbank. We guessed that the river is too powerful for dams so we think they stay in burrows in the river banks instead. Later the clouds broke up and the sun poked out so we ‘rafted up’ to remove our fleeces before paddling on to ‘the slide’. This is an area of small rapids which we were a bit unsure about! Its a narrowing of the river caused by a rock slide and we knew we were nearing it as a dull roar rather intimidatingly got louder and louder. It was short though and we were soon through but the eddies afterwards swept us round off to the side before we both managed to take control again and paddle on. The confluence of the Green and Colorado rivers is an iconic landmark which we passed by quickly before settling onto a sand bank for some lunch. We had three miles now of faster flowing water down to ‘Spanish Bottom’, an open area of the canyon where we had pre-arranged for the kayaks to be picked up by a tourist boat the next day. We both agreed we will be sad to leave the river- it has been sublime! Just beyond ‘Spanish Bottom’ the canyon narrows and the river plummets into a series of rapids- ‘Cataract Canyon’, a no-go area for us! After pitching the tent we wandered downstream to have a close look at the rapids of Cataract Canyon. It’s a lovely short hike in its own right, and we felt lucky to have this spot to ourselves. 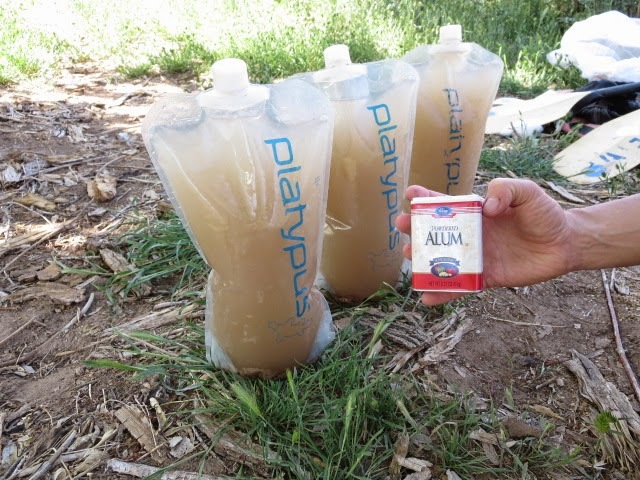 Tomorrow the boat hire company will picked up the kayaks and we will shoulder our packs and continued on foot, taking as our drinking water some of the Colorado (and its silt). Great photos guys. That water sure looks muddy!